Kate Murphy knows she can run faster in the 1,500 meters, she just needs competition. She’ll finally get it July 7, when she races the first round of the U.S. Olympic Track and Field Team Trials in Eugene, Ore. She’s one of two high school students to qualify and currently has the 17th fastest seed time. 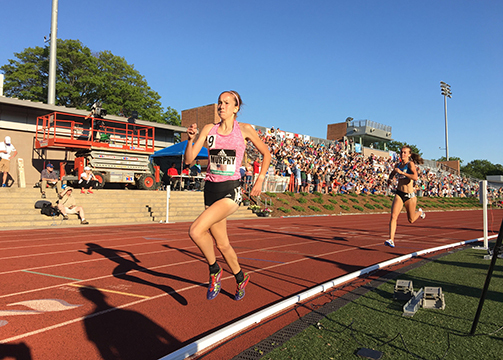 A 62-second final lap in the “Dream 1500” at the adidas Boston Boost Games June 17 carried her to a 4:07.21 finish, two seconds under the trials qualifier. She ran seven seconds faster than second-place Katie Rainsberger and more than a second faster than Cory McGee did in winning the professional women’s 1,500 meter heat. It made Murphy the third-fastest all-time high school 1,500 meter runner, after Mary Cain (4:04.62) and Alexa Efraimson (4:07.05). Cain ran 4:10.84 in McGee’s heat, her season’s best mark. Murphy finished her junior year at Lake Braddock three days later with a Spanish final before packing for a three-week trip to California and Oregon that will include the USA junior championships in Fresno, the Nike Elite Distance Camp in Portland and the trials in Eugene. A trip to Bydgoszcz, Poland follows two days after she gets back from Eugene, after she won the U.S. junior 3,000 meters, again over Rainsberger. Her father, Howard, will be with her during the competitions, following what he describes as the best Father’s Day gift ever: watching her qualify for the trials. Lake Braddock alumnus Ed Lull has set up a Go Fund Me account to raise money to pay for flights and lodging for Murphy’s coach Mike Mangan and massage therapist Pete Sherry to join her in Eugene. Read more here. She wound up in Boston after rolling her ankle the day after the Virginia state meet and passing on a 1,500 meter race the following weekend in Princeton, giving her a 13-day break. It also helped, Bruins coach Mike Mangan said, that Boston meet organizers limited the extra, non-athletic parts of the trip to keep runners fresh. They also cut the high school girls’ mile to 1,500 meters and recruited Duke alumna Anima Banks to serve as a rabbit. Just before her race, Murphy watched professionals Ajee Wilson and Molly Ludlow break 2:00 for 800 meters. Banks was out in 52.29 seconds for the first 300 meters of the 1,500. Three other high schoolers closely trailed Murphy, who had moved up to Banks’ hip. Then, before they hit 700 meters (in 1:58.19), Murphy took off. It was also the nature of the metric mile, removing more than 100 meters from her race. Because the race started on the back stretch, she hadn’t adjusted to the kinds of splits she would be hearing. Banks retook the lead for another half lap before dropping out at 900 meters, and Murphy started the bell lap in 3:05.16, after a 67.97-second lap. And she did: 62.05 seconds. Rainsberger, not a second behind her at the bell, closed in 68. Though Murphy was the Virginia 6A and Nike Cross Southeast champion, her heart circles the track. When she last raced Rainsberger, Murphy was 16th at the Nike Cross Nationals meet; Rainsberger was first, 31 seconds ahead. Making the Olympic Trials was on Murphy’s mind throughout the spring season, but getting the chance to try was hard. Though she set a junior class record in the 1,000 meters (2:45.36), she didn’t feel capable of running fast indoors, and when the outdoor season started, her efforts turned to relays, like anchoring Lake Braddock’s winning distance medley relay team at the Penn Relays, and team-oriented racing. “Kate’s talented enough that she can train through most of her high school races and be just fine,” Mangan said. “We gave her two days of rest before she ran her 1,000 meters, but otherwise she’s been training through. The state meet was another story. With Lake Braddock looking at a steep road to the 6A championship, Murphy ran just one race, the 800 meters, finishing second to Patriot junior Rachel McArthur. Though she ran 2:06.70, her best time by a half-second, Murphy’s confidence flagged about running the trials qualifier, which would take a five-second PR. “I had a lot of doubt in my mind this season,” she said. “I couldn’t even win the state meet. I hadn’t really run fast (though many would disagree), and I wasn’t going to have too many opportunities to run 1,500s. A lot of things could go wrong. But Mangan said her all-out racing frequency was deliberate. Despite her talent, Mangan didn’t want to exhaust her. It helps that Murphy is “not a kid motivated by a medal,” Mangan said. “Maybe an Olympic medal. But when the big events present themselves, she attacks, like at the Swarthmore Final Qualifier in Pennsylvania May 16, a last-chance meet for NCAA athletes to make championship meets. Murphy ran away from the 1,500 meter field to run 4:14.26, 0.03 seconds faster than second place and 14 seconds faster than third. It was faster than her USA juniors-winning time the year before. First up is the USA junior race in Fresno June 24-26. As of Thursday, she is entered in both the 1,500 meters and 3,000 meters. “The goal there is to get to Poland in whatever event she can,” Mangan said. That race might bring out the best in Murphy. “I think it’s better, you run your fastest when you aren’t focused on the time,” she said. She’s finally getting her shot to run unbound by rationing herself. “In high school, you do so many races where you just have to do enough to win that you forget how to just run,” she said. She’ll have to do that at the trials, where three heats will narrow down the field from as many as 30 to the three Olympic team members. Among those 30 are D.C. area residents Kerri Gallagher, with a 4:03.56 time (sixth fastest seed time) and a 2015 World Championships team trip to her name, and Rachel Schneider, whose 4:06.90 has her 15th. Murphy’s seed time ranks 17th. If she were to finish in the top three at the U.S. Olympic Trials, she would need to run faster than 4:07.00 to make the U.S. team. In 2012, semi-final qualifiers ran between 4:14-4:17. Finals qualifiers ran 4:08-4:10, and the top three finalists ran 4:05.17 and faster. They are all tactical races, with place, not time, paramount. She’s still sharpening her speed. The day before leaving for California, she ran a set of four 700 meter intervals: 400 meters, a 100 meter recovery, then a 200 meters. She ran 67, 66, 63, 61 for the 400s and 33, 32, 31, 29 for the 200s. She does most of her workouts alone, with no teammates who can keep up. Freshman Edward Cerne has helped out a little. 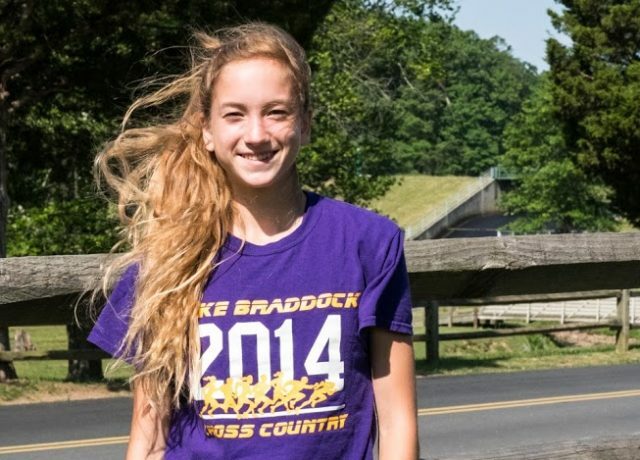 Her 4:07.21 converts to a 4:25.38 1,600 meters, which makes her the third-fastest Bruin — boy or girl — returning to the Lake Braddock team next year, and the 43rd overall fastest runner in Virginia returning next year. Wait a Minute, was That? Go Christo!